For more than a century, women in the United States struggled to obtain the right to vote. As they sought to claim their rights as citizens, they confronted deeply entrenched prejudices against women’s participation in political life. In 1920, the suffrage movement finally achieved victory with the ratification of the Nineteenth Amendment to the Constitution. Having won the vote, many women’s rights activists continued to work toward a broader definition of social and political equality. 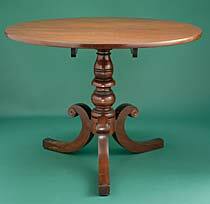 On this parlor table, Elizabeth Cady Stanton drafted the Declaration of Sentiments, a radical demand for equality that launched the first women’s rights convention, in Seneca Falls, New York. Modeled after the Declaration of Independence, Stanton’s document proclaimed that “all men and women are created equal” and resolved that women would take action to claim the rights of citizenship denied to them by men. The Declaration of Sentiments was adopted officially at the Seneca Falls Convention in July 1848 and signed by sixty-eight women and thirty-two men. In 1917, militant suffragists staged a months-long vigil outside the White House. Tolerated at first, the picketers drew increasing criticism after the United States entered World War I. 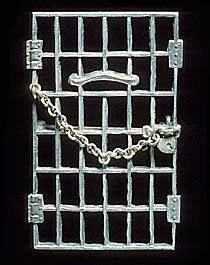 More than ninety women were arrested for “obstructing traffic” and sent to prison, where they suffered mistreatment and waged hunger strikes. The resulting publicity helped put pressure on Congress to consider a suffrage amendment. For the suffragist who wore this yellow sash in the early 1900s, the color of the silk was as meaningful as the “Votes for Women” slogan printed on it. After Kansas suffragists adopted the state symbol of the sunflower for a campaign in 1867, yellow became the symbolic color of the national women’s suffrage movement. Supporters were urged to “show your colors” by wearing yellow ribbons, buttons, and sashes. In 1972, Congress passed the Equal Rights Amendment (ERA), which would guarantee men and women equal rights under state and federal law, and sent it to the states for ratification. 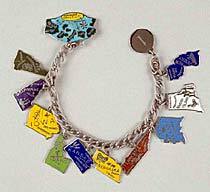 This bracelet, representing eleven of the thirty-five states that ratified the ERA, was worn by Alice Paul, who drafted the original amendment in 1923. From 1972 to 1982, supporters campaigned to get the required thirty-eight states to ratify the amendment. But the effort was opposed and ultimately defeated by those who feared the ERA’s moral and legal impact on American society.